The majority of the archive material we hold is in our offices at Bowcliffe Hall. We welcome donations of Alvis material and also offers of collections and individual items to purchase. We are open to visitors, by appointment, every Wednesday and other days by special request. A day in Coventry should include a Tour of the Transport Museum and a visit to the rest of the archives, held at the History Centre of the Herbert Museum, just a few minutes walk away, a route which takes in the sights of both the Cathedral and the University. The History Centre is on the ground floor of the Herbert, a modern glass structure, next to the cafeteria, good for a lunchtime snack. It is preferable to give notice of your visit but not essential. What is in the archives is listed on a computer and you request what you want to see by making out a slip with the reference on it, and a member of staff goes into the bowels of the building to retrieve it. You are then able to sit a table within a secure area and browse to your heart’s content. The archives include complete bound sets of Autocar and Motor and old registration records for the Coventry District. As well our holding much of our material, the Herbert has a great collection of Alvis photos and documentation which has not yet been catalogued. We are steadily going through these, scanning and identifying them. Not everything is held in the Herbert, so if you have anything in particular you want to see, ask the trustees first……send a comment. The Trust exists for the preservation of all Alvis related records and material and to arrange for them to be accessible. It currently holds a range of brochures, photographs, books, films and publications relating to Alvis Plc, the Alvis Register and the Alvis Owner Club all of which have long histories. This material complements the records and factory material held by Red Triangle Autoservices and the Alvis Car Co. Ltd. The trust is independent of Alvis, the Register and AOC but currently relies on the AOC for funding. It holds a small reserve from monies raised for the trust over the past few years. As more income is generated directly the trustees will hold the funds separate from the AOC. Any donations or pledges will be dealt with in a professional manner in accordance with your wishes. The trustees are experienced in dealing with such matters. 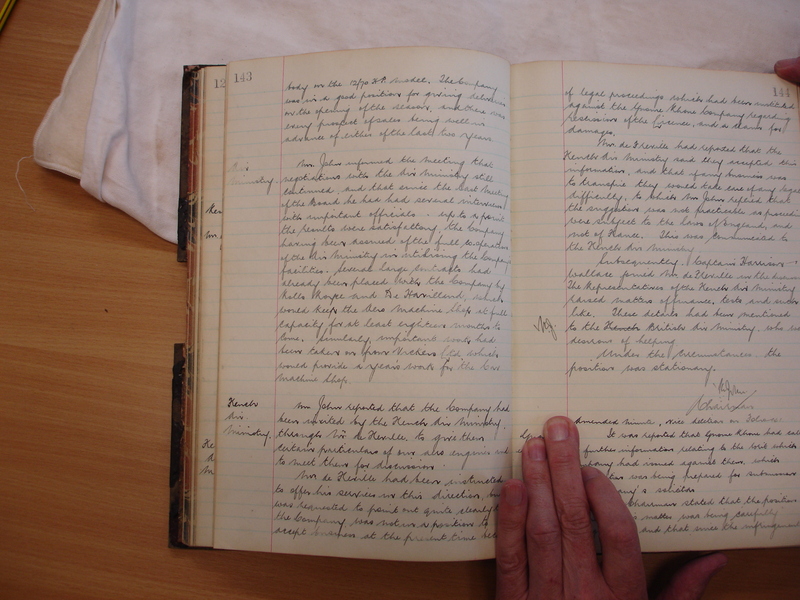 The minute book was found the archives of the Herbert and there are others both there and in the Motor Museum. If you let us know the name you are looking for we can enquire next time we visit. Thanks for the reply – great to hear that it’s the Herbert. My grandfather was Leopold Wilfrid Adams – Sales Director at Holyhead Road until his death in August 1933. As I’m still in Coventry I hope to see these minutes for myself and try to find any other reference to Leopold. Thanks again. Just wondering if you have any details in relation to the Alvis Scorpions delivered to the Irish Defence Forces in March 1980. I recently found pictures here in Ireland of them being tested by the Irish at the Holyhead Road factory. They show a carb test as well as a dunking tank to allow the tanks to swim. Most of our records relate to cars but you may find something in Coventry Transport Museum or through the AFV Society. my father, now 96, owned JY 4329 back around 1958. I believe it is an Alvis Speed 20? I came across a picture of the car with his first daughter in some old papers. I can send you a scan of the pic if you like. I’m trying to trace my father’s old Alvis, but have for certain only the fact that it was a black saloon registration number KLT 913. Can you tell me where I need to look, if you don’t have such information? Thank you. We can identify the car as a TA14 Mulliners saloon, chassis number 23095. If you look on the fourteen website https://alvisfourteen.wordpress.com/ and click on TA14 Gallery 2 you will see several of them, including 23094 but not the actual car. It is not on the DVLA website so has probably been scrapped. The last owner we have recorded was in Pinner by the name of Sainsbury in the 1960s. Thank you so much. I presume no record at DVLA means someone else has taken the registration number for another car. I guessed it was a TA14, and one day I would like to get such a one myself. It was a lovely car. I was lucky enough to be involved in the Alvis Denmark tour in the 80´S when Mike Cummins asked me for a deal as I was Passenger Sales Manager for DFDS at the time. I was able to secure a good rate, and me and my late partner, Rod Eagles, accompanied the group to Esbjerg, with a super party on board “DANA ANGLIA”. This included Peter(?) Talbot and the Amazing Grace in “The Dull One” DUL111 with a beautiful Mayfair body, and there is a super picture of Rod looking very proprietorial in the front seat with Grace looking on. I also remember a Dutch Alvis, British Racing Green with a Margaret Rutherford lookalike wrapped in a plaid travelling rug. I was also fortunate enough to take the group on a similar tour of Sweden a couple of years later. I was on that Tour too in SHP 642 on its first overseas trip after restoration and have a number of photos which I will post some time. We have also received an album of photos from a late member. Sadly many of the participants are no longer with us but the cars are.